Looking for Summer Craft Books? Here are some of my favorites! You are here: Home / Media Reviews / Looking for Summer Craft Books? Here are some of my favorites! Follow the Yellow Brick Road to a charming combination of storytelling and crocheting! 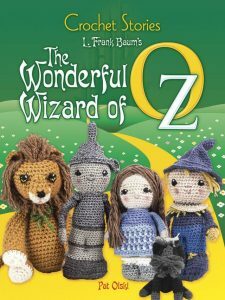 Suitable for beginning to intermediate crocheters, this book features a retelling of the classic adventure story, punctuated with nineteen patterns for L. Frank Baum’s beloved characters, plus their settings and accessories. The much-loved tale begins in Kansas and follows Dorothy and Toto to Oz, presenting patterns for the little heroine, her dog, and her Uncle Henry and Aunt Em. Storybook chapters of her arrival and encounters with the people of Oz follow, accompanied by patterns for a Munchkin, the Good Witch of the North, the Wicked Witch of the East (consisting of Dorothy’s house with the witch’s magic slippers sticking out from underneath), and a stretch of the Yellow Brick Road. Subsequent chapters introduce Dorothy’s new friends — the Scarecrow, Tin Woodman, and Cowardly Lion — and those they meet in the Emerald City — the Wizard, the Wicked Witch of the West, a Winged Monkey, and the kindly Glinda the Good. In addition to these characters, the full-color patterns include key storytelling items such as the poppy, Emerald City spectacles, water bucket, and magical golden cap. A photo gallery of many of the story’s characters provides a delightful conclusion to the book. If you love the Wizard of Oz (and who doesn’t? ), and you know how to crochet…you will love this book! I think that I will learn to crochet just so I can make some of these adorable characters! If you are a fan of Alice in Wonderland and like to color..this one is a must!